Times Education’s Global Relationship and Development Strategy has benefited thousands of domestic and international students over the years. Times Education has in place articulation arrangements both with Australian and overseas tertiary institutions. Sydney is the largest city in Australia and the capital of New South Wales. Some of the major tourist attractions include the Sydney Harbour Bridge, the Opera House and of course the iconic, Bondi Beach. Sydney is a cosmopolitan city and truly multicultural with many restaurants and China Town not far from Wells International College. Travelling around Sydney is relatively easy as it is the transport hub of NSW. There are many educational institutions including Colleges, Institutes and Universities. Students can purchase a travel ten ticket and get around the city by trains, buses, ferries and light rail. There are lots of beautiful beaches and less than an hour from the city you can be in the natural bush land surrounding the major metropolitan area. There are cinemas, restaurants and plenty of things for you to do with your time in Sydney. Brisbane, the capital city of Australia’s “Sunshine State”, Queensland is one of the most affordable study destinations for students, offering value for money and affordable cost-of-living expenses in a safe and welcoming environment. Studying and living in Brisbane puts students in the best location to explore some of Australia’s popular tourist destinations and favourite beaches such as the Gold Coast, the Sunshine Coast and Byron Bay. Our new state of the art campus has been purpose-built for student-centric learning and is located in the Central Business District (CBD), close to easy-to-use public transport, great shopping precincts, and affordable student accommodation. A short walk or ferry ride away there is also the popular South Bank Parklands district offering Australia’s only riverside inner-city beach and a hub of restaurants, activities and buzzing nightlife. Times Education welcomes students to Queensland, beautiful one day and perfect the next! Xiamen Located in the southeast of Fujian Province, Xiamen is a hub city, as a beautiful coastal city, Xiamen was once accredited as “Oriental Hawaii”, a premier international seaport and a popular tourist destination on the southeast coast of China, reputed as the “Garden on the Sea”. Xiamen is one of the major ancestral homes of overseas Chinese and Hong Kong, Macao and Taiwan compatriots. Nowadays, Xiamen is poised to embrace the historic opportunities for deepening reform and expanding international cooperation, by leveraging the “Belt and Road” Initiative and Pilot Free Trade Zone policies. Chengdu is the capital of Sichuan Province, the most liveable city in West China and the fourth most liveable city in China. Chengdu is the home of the Giant Panda, the Red Panda, and the world’s largest Panda breeding and research base. Chengdu is also very accessible. 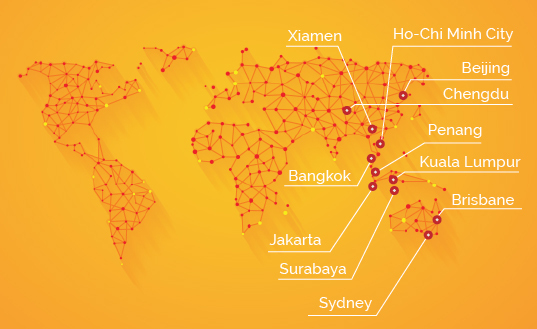 It’s an international airport is the 5th biggest hub in China; there are regular direct flights on offer from big cities in and outside of China, for example Sydney, Amsterdam, Abu Dhabi, Tokyo, Beijing etc. Beijing is the capital of the People’s republic of China and it’s the place where the Central Committee of the Chinese Communist Party and the Central People’s Government of China are located. During the long process of the Chinese history , Beijing had been the capitals for five dynasties, they are Liao, Jin, Yuan , Ming and Qing dynasties. So Beijing become the cultural, economic and political centre of China since time immemorial as well as a world famous ancient city . this fast changing city gives an impression of a modern city with strong traditional flavours. Fuzhou, the capital of southeastern China’s Fujian province, is a sprawling industrial and transportation hub. Its downtown includes the “3 Lanes and 7 Alleys” quarter of preserved Ming and Qing dynasty buildings. The mountaintop Yushan Scenic Area features the restored 10th-century White Pagoda. West Lake Park, dating to 282 A.D., is an urban green area with bridges and pavilions.